This exploratory creative process will help you turn your vision for the best version of your life into a work of art. Using the images that we provide and your own, you’ll learn how to create a Joy-Filled Vision Board that will motivate you to move towards the life that you deserve – every day. From teaching you how to clear and set up your work space to giving you suggestions for material to use on your vision board, we’ve got you covered. 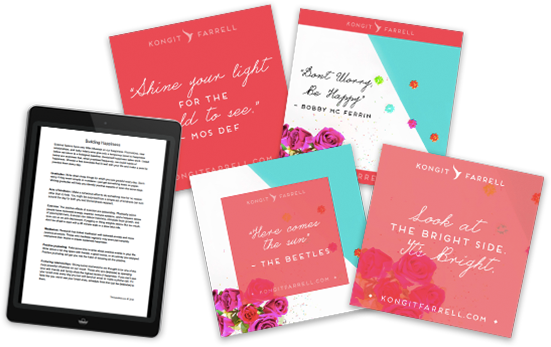 Enjoy a variety of uplifting affirmations that we made just for you to cut out and add to your Joyful Life Vision Board for an extra boost of…..Joy! Process questions that are designed to help you reflect on ways to invite more joy into your daily life. Download, Print, Post, or Share 4 beautiful quotes to keep your mind growing in the direction of Joy. They're candy for your eyes, too! © Kongit Farrell. All rights reserved. Website by Christine Marie Studio.